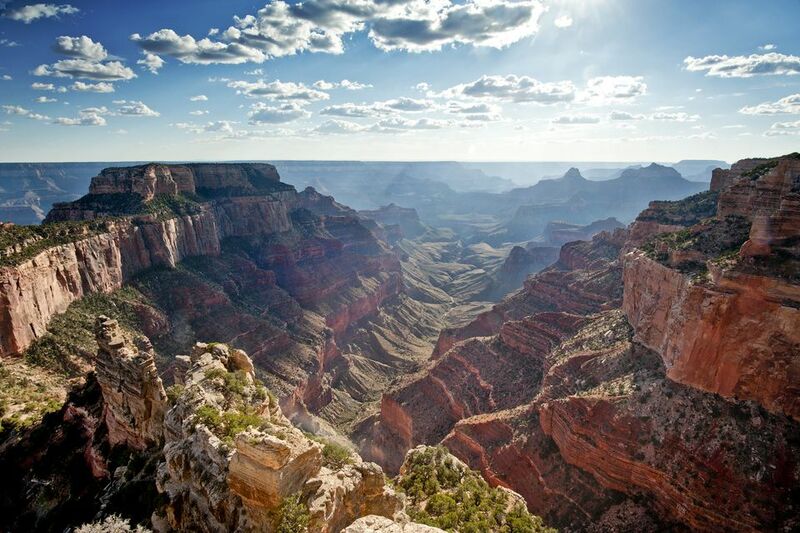 When visiting the Phoenix area it may be well worth your while to plan a short trip to the Grand Canyon. While camping, mule tours, air tours, and backcountry hiking trips may be a part of some vacation plans, often people just want to drive up for a day or two, see the magnificence of the Grand Canyon, and then head back to the Phoenix area. This feature is intended for those of you planning a day trip to the Grand Canyon, or an overnight trip, to assist you in getting the most out of your short visit to the South Rim. Tip: If you plan to go to the Grand Canyon for just the day, you can get in at least 4 or 5 hours before heading back home. This, of course, assumes you leave early and prepare for a long, tiring day. If you plan to go up and back in one day, make sure you have at least two drivers who can switch off in one or two-hour intervals—four drivers would be even better! Barring any unusual traffic situations, it takes about 4 to 4-1/2 hours to get to the Grand Canyon from Central Phoenix. This assumes only one or two short stops along the way. Find the shortest route from where you are to I-17 North. Take I-17 North to I-40. Take I-40 west to Highway 64. Take Highway 64 north directly to the South Rim. The entrance fee to Grand Canyon National Park is $35 per private vehicle (as of October 2018). This covers everyone in the car. There are reduced fees for motorcyclists and people entering by bicycle, on foot, by train, and by park shuttle bus. Keep your receipt, since the permit you receive upon paying the fee is good for 7 days. If you have a National Parks Golden Eagle (general annual pass), Golden Age (62 and older), Golden Access (blind and disabled), and Grand Canyon Park Passes, you can get in at a reduced fee or at no charge, depending on the pass. If you fit the categories of either the Golden Age and Golden Access, get one on this trip. Even if you never use those passes again, you will save 50% or more on your entrance fee to the Grand Canyon National Park. On certain days of the year, all national parks offer free admission for everyone. A Visitor's Guide. This includes information about parking lots, bus routes, and South Rim viewpoints. Tip: Read about the Grand Canyon's history, peoples, and geology before you get there and save your time at the park for viewing the canyon from the various vantage points offered. Leave the receipt, glossy brochure, and most of the newspaper in the car. Take the Shuttle Bus Route map with you. Once you are inside the park, you will have to decide if you will drive to various parking lots and walk to some of the rim viewpoints, or if you will park in one place and take the shuttle bus. Or you might do a combination of the two! Your decision might be based on how crowded the area is that day. In the case of a busy day, it might be best to find one central place to park (there are several parking lots) and use the park's free shuttles for your park visit. There are five parking lots. Tip #1: People have a tendency to stop at the very first point at the Visitor Center to get that long-awaited view of the Grand Canyon. It is crowded and a bit of a walk from the parking lot at Mather Point to the Visitor Center and the actual view at the rim. If you are willing to skip the visitor center, plan to park in another lot on a shuttle route. Tip #2: Not all shuttle stops are made in both directions, so make sure you park in a lot that doesn't involve too long a walk on the way back. If you haven't been to the South Rim of the Grand Canyon in several years, the Shuttle Buses will be new to you. There are several shuttle routes. The Kaibab Trail Route runs year-round and is the shortest with the fewest stops and fewest points to see the canyon. The Village Route also runs year-round and provides transportation between the Visitor Center, hotels, restaurants, campgrounds, and shopping. This is the most crowded part of the Grand Canyon Village. The Hermits Rest Route (March - November) is the only way to see the various points west of the Village. The buses run every 15-30 minutes, depending on the season. Make sure you check the evening schedules if you will be in the park at night. Tip #1: Be careful to check the maps at each bus stop, including which stops are made in which direction. Tip #2: The color of the bus, or the color of stripes on the bus, have nothing to do with which bus it is! Check the signage on the bus to determine which shuttle it is. There are hotels inside the Grand Canyon Village that are all operated by Xanterra Parks & Resorts. These should be booked well in advance of your visit. You can make reservations online. Tip: If you cannot get a room inside the Grand Canyon Village, you can find one in Tusayan which is just seven miles from outside the Grand Canyon National Park at the South Rim. The restaurant at the El Tovar Hotel is very popular, and reservations made in advance are required if you would like to eat there. The other higher end restaurant is the Arizona Room, right next to the Bright Angel Lodge. They do not take reservations, but you should get there well before sunset to get in. There are numerous other restaurants, cafeterias, and snack bars, mostly in the Village area and near the campgrounds and RV park. Tip: If you are only going up for a day or two, eating should not take up much of your time. Don't make reservations for dinner; you don't want to arrange your day around a meal that you can get any time and anywhere in the Phoenix area. For a day trip, bring food along in a cooler in the car so you can spend the most time enjoying the sights, or eat at one of the cafeterias or at the casual Bright Angel Lodge restaurant. If you are staying the night in Tusayan, there are plenty of eateries close to your motel where you can eat after dark. Check current weather conditions and information on road closures at the Grand Canyon, and to see the average temperatures during the year. Tip: In the spring and summer wear a hat, bring water, wear sunscreen, wear sunglasses. Wear a hat with a wide brim, like a Tilly hat. Don't worry about looking a bit silly. One of the great things about the Grand Canyon is that absolutely everyone there is a tourist! You will find fewer crowds in the early spring or late fall. The South Rim is open year round, but try to avoid the times when schools are not in session. If you have to go during the summer when it is most crowded, try to go during the week and not on weekends. If you have to go on a weekend, just be patient! Tip: The best photos of the Grand Canyon are at sunrise and sunset. Why not get there super early and beat the crowd? The Grand Canyon, like most of Arizona, does not observe Daylight Saving Time. It's on Mountain Standard Time year-round, which is the same time zone as Phoenix and Tucson.